One of the big questions when it comes to researching and preparing for heart surgery is “how will I recover?” Dr. Ciuffo knows that these concerns are stressful, overwhelming, and scary. One of the major benefits of minimally invasive heart surgery over traditional surgery are the improved recovery times, substantially less pain with recovery, and shorter time to normal activities. 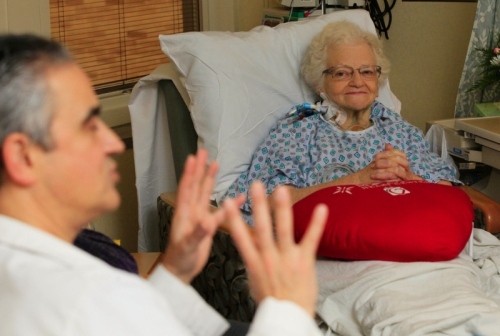 Even the sick, elderly, and frail patients can enjoy a fast and uneventful recovery. Without the dramatic techniques used in traditional heart surgery (i.e. 8 inch incision in chest, broken sternum/ribcage), patients can expect a much easier time post-surgery. The morning after surgery most patients are comfortable and wide awake. The chest tubes, bladder catheters and monitoring lines are removed and our patients are allowed to stand up and sit out of bed in a chair. Affects of anesthesia are present, which may include no appetite, constipation, and bloating. A mild soreness at the incision site is normal and easily managed with pain medication. Patients are also encouraged to walk as much as they are comfortable with and to perform deep breathing exercises to clear their lungs. During day two and three, patients are awake and comfortable. Any residual symptoms from anesthesia are no longer present. Walking is still encouraged, and patients find that it gets much easier to walk up and down the hospital corridors. Most of Dr. Ciuffo’s patients are able to be discharged home or to a rehab facility in two to three days after surgery. Once our patients are home or at their rehab facility, Dr. Ciuffo recommends a gradual increase in physical activity. By two weeks post surgery, most patients are able to resume their daily activities, including driving and going outside. For our out-of-state patients, most are able to travel back home within seven days of surgery. Doesn’t that sound better than two months of pain and very little physical activity and a week in the hospital? If you or a loved one would like to learn more about our minimally invasive heart surgery procedures, what your recovery could be like, and your options, contact us today! Call our office at (330) 588-4676 or contact us online.